Reddit is a perfect place for a healthy discussion on various topics. It is one of the most visited websites on the web. Reddit has a huge number of communities/groups (called as subreddits) where people share website URLs, post new questions or answer existing ones. The most interesting feature of Reddit is its voting system. If a question or link is interesting, people will upvote it. If it is offensive or uninteresting, users will downvote it. Although Reddit has a large user base, it isn’t a great place to seek medical or personal advice. The user’s profile lacks a profile picture. Furthermore, it doesn’t have a bio section. Any person can pretend to be an expert on Reddit. Below, we’ve shared the best Reddit alternatives which you can use to get professional advice, discuss topics of your interests, find interesting websites, and more. Quora is the best Reddit alternative right now. It is powered by a smart algorithm which makes sure that every unanswered question is answered by a knowledgeable or right person. Quora is used by well-known personalities. You’ll find genuine profiles of top executives, engineers, doctors, scientists on Quora. When you post a question on Quora, you can follow the topic and ask an expert to answer it. 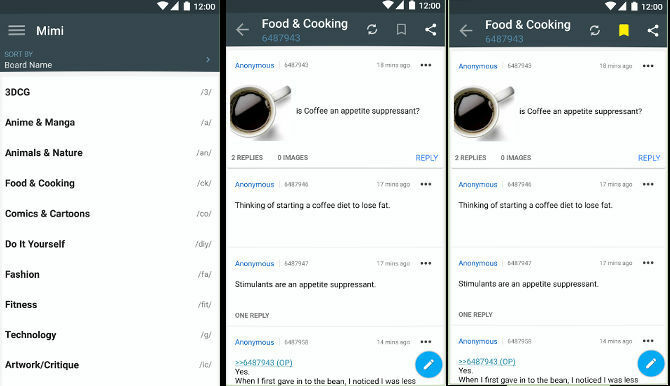 The app lets you post questions anonymously. Quora doesn’t have communities. Quora allows unregistered users to read answers to only 1 question. To go through answers to multiple questions, you must log in to the app with your Google or Facebook account. Quora has answers to questions on topics ranging from politics to health. It lets you tag questions. The site displays related questions on the sidebar. To see similar questions on the mobile phone, you must scroll down or tap the tag. 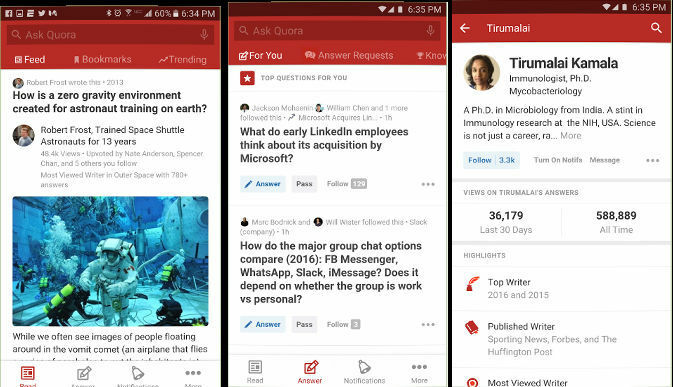 Quora prompts new users to select their favorite topics. It has a feed section that displays the freshest and trending questions. 9Gag, the Reddit alternative is the home to some of the funniest and coolest GIFs and images on the web. Like Reddit, 9Gag is easy to use. You don’t have to create an account to explore the massive collection of pictures in 9Gag. 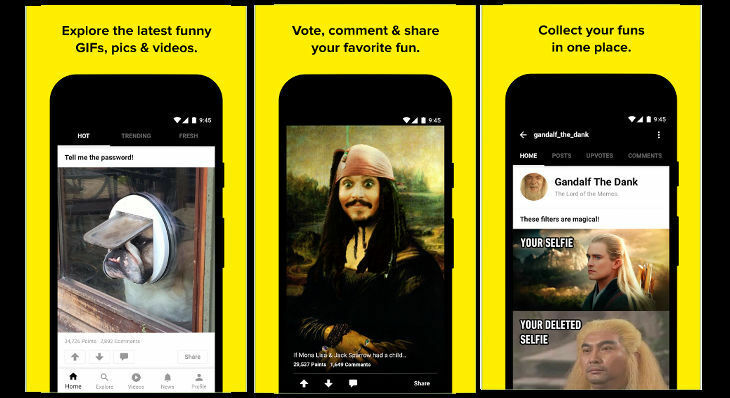 The 9Gag app groups pictures in various categories. Each category has 100+ image or GIFS and two subcategories – hot and fresh. To see the most viewed pictures, tap the top subcategory. To view the newest images, open the Fresh subcategory. The app loads images quickly. It lets users upload and share photos anonymously. 9Gag app plays GIFs automatically. It includes a search option, voting system and an option to share the image on third-party sites. You can comment on pictures in 9Gag. If you use Reddit to discover interesting images, you’ll love the 9Gag app. Ask FM is a great app to find new and interesting people. It is primarily used by teenagers. 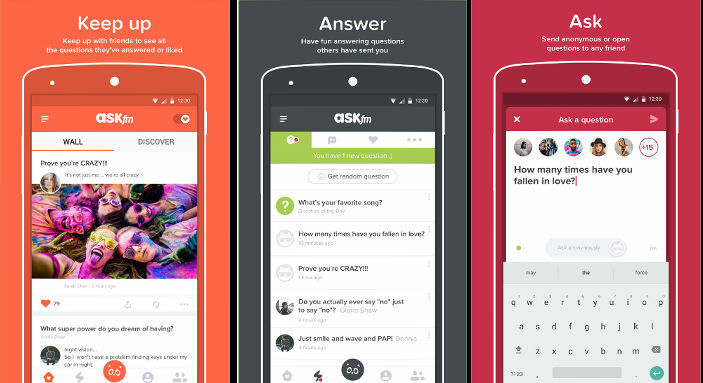 The main interface of AskFM features 5 tabs/sections – home, questions, discover, profile, and friends. The Home section has options to find friends and share profile on social networks. The question tab boasts a list of questions asked by AskFM users. The Discover section displays a feed of hottest updates and questions published by users. The profile tab lets you change your display picture and status. It also boasts your recent activities, the number of followers, etc. You can ask a direct question to any user of the app. If you find the user’s profile or DP interesting, you can follow him/her. Unlike Reddit or Quora, Ask FM doesn’t provide a search option. StumbleUpon is a great app to discover and submit interesting web pages. Unlike Reddit that opens URLs in a browser or in a new tab if you’re browsing the Reddit website, StumbleUpon displays the full content of the shared web page. The app recommends top-rated content to its users. 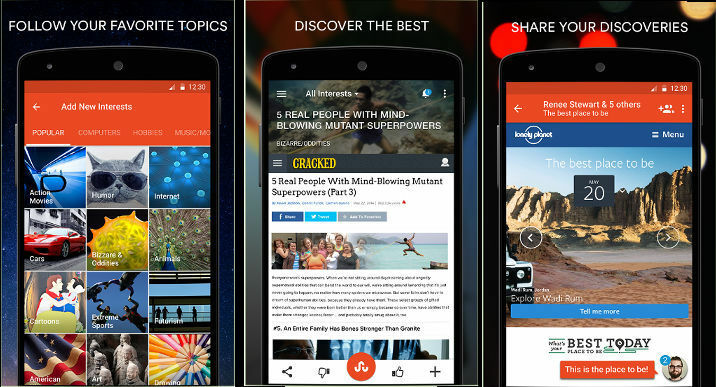 StumbleUpon allows users to follow topics of their interests. It lets you like, bookmark, and share the pages worth reading. The StumbleUpon app compiles a list of pages you’ve liked. To see the list, tap the Like option of the app’s menu. This list is public and other users can follow it. Users of the StumbleUpon app are called Stumblers. You can follow Stumblers to get regular updates from them. Although 4Chan is the best site like Reddit, its developer hasn’t introduced the official 4Chan app for mobile devices. 4Chan’s website is mobile friendly. Hence, you can explore it on web browsers. 4Chan is a large website. If your mobile data connection is slow, you won’t have a great time exploring 4Chan. An app called Mimi 4 Chan comes in handy in this case. M4Chan app allows you to explore 4Chan threads. It enables you to comment on topics you find interesting. M4C provides an option to download images embedded in a thread. If a thread is offensive, you can hide it in this app. Mimi 4Chan supports tabbed browsing i.e. The app opens a new tab for a different thread. It provides three color themes – light, dark, and black. It enables you to customize the toolbar color and change the text font size. You can also set a color for the text content in the Mini 4Chan Reader app. Boats is the third-party app that allows you to explore the popular news aggregator site Voat on Android devices. It has a dark-themed interface. The Boat app includes an option to log in to Voat, comment on thread posts, vote threads, etc. The groups in this app are displayed on a beautiful slider. Boats lets you download and share images. It supports left-hand mode. Users can share URLs of websites in the app. The app doesn’t maintain a history of URLs you’ve visited. 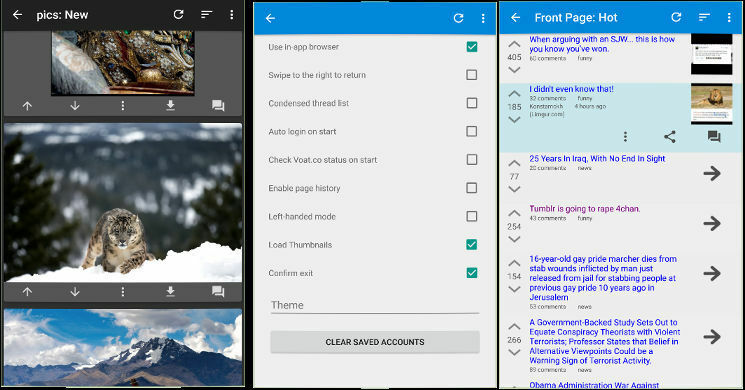 To enable page history, open the settings interface of the app. You can configure Boats to prevent loading of thumbnails and save data. The application lets users subscribe to group updates. It provides a good experience on smartphones as well as tablets. Reddit is a great app. If you don’t like it, you should try out Quora, AskFM, Voat, 4Chan, StumbleUpon or 9Gag.